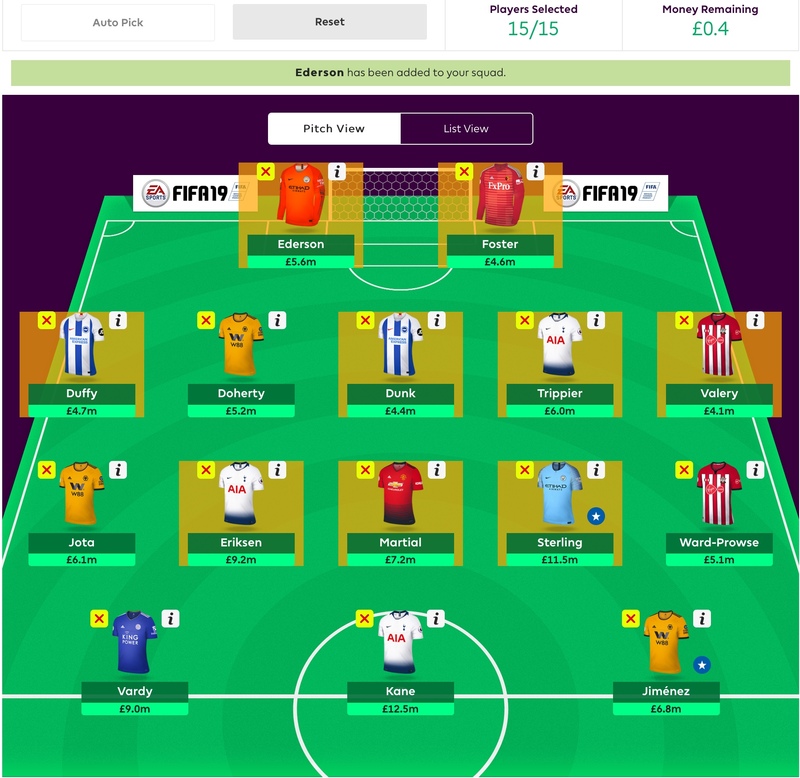 As the business end of the season draws near, it’s time to start tinkering with our Gameweek 34 wildcard. With two double gameweeks remaining in the schedule and Bench Boost to use in Gameweek 35, planning is key. UPDATE: After a few days considering our options, some changes have been made to the initial draft! A price rise for Jamie Vardy has allowed some tweaks. This draft allows Manchester City defensive coverage, with Ederson looking safer than Laporte. Robertson is sacrificed, but double Brighton defence is retained through Dunk. Camarasa becomes Jota to allow Vardy to be retained for his plum home game in the Gameweek 34 wildcard against Newcastle. He will then be upgraded to Lacazette for Double Gameweek 35 as the planned transfer. Jota is somewhat of a placeholder for now and could easily be a Watford or Southampton midfielder. There is some risk in this strategy, with exact funds currently for the planned transfer. Any injuries or suspensions could result in a points hit being taken into 35. There’s also no Liverpool assets, with serious surgery needed to accommodate them for Gameweek 36. Brighton and Cardiff have a Double Gameweek in 34. Brighton are of particular interest, as the only team with two Double Gameweek’s remaining. Cardiff still have plenty to play for as they battle relegation. For Brighton, the main candidates for inclusion are Matt Ryan, Shane Duffy, Lewis Dunk and Glenn Murray. With players likely to be retained for two gameweeks, a triple up on the Brighton defence for this period and going forward seemed a little risky: especially with a tough pair of Gameweek 35 fixtures too. Glenn Murray is an interesting selection, but due to his age, it’s unlikely he will start both matches in each double gameweek. Clean sheets look unlikely for Cardiff, but Victor Camarasa has great attacking threat through set pieces, and has been our stalwart bench fodder throughout the season. He won’t be retained into the Double Gameweek 35 bench boost, with a free transfer to upgrade him to a double gameweek midfield asset from Wolves, Watford or Southampton. Manchester City, Manchester United, Spurs and Arsenal all have a Double Gameweek, so are important to include in the Gameweek 34 wildcard. Liverpool and Chelsea are restricted to single gameweeks. To add to the dilemma, all six teams are still participating in European Cup fixtures, with the race for the title and the race for top 4 positions still tight. Manchester City also have an FA Cup final to contend. Manchester City have a tricky double, but great fixtures surrounding it. Rotation is an obvious concern, as they chase the quadruple, and the defence is overlooked as clean sheets look unlikely against Spurs and Manchester United. Raheem Sterling, Kevin De Bruyne and Sergio Aguero provide the most interest in attack. Sterling has the higher fitness of this trio as their highest FPL scorer this season. Manchester United also have tough fixtures for the run in and in the double. The defence is overlooked due to the tough fixtures, with Paul Pogba, Anthony Martial, Marcus Rashford and Romelu Lukaku considered in attack. Rotation will again be a factor: Pogba is out of form, plus Rashford and Lukaku could well rotate so for now, it’s a punt on Martial as our Manchester United cover. Other than an away trip to the Etihad, Spurs have an excellent run in for the season, as they bed into their new stadium. 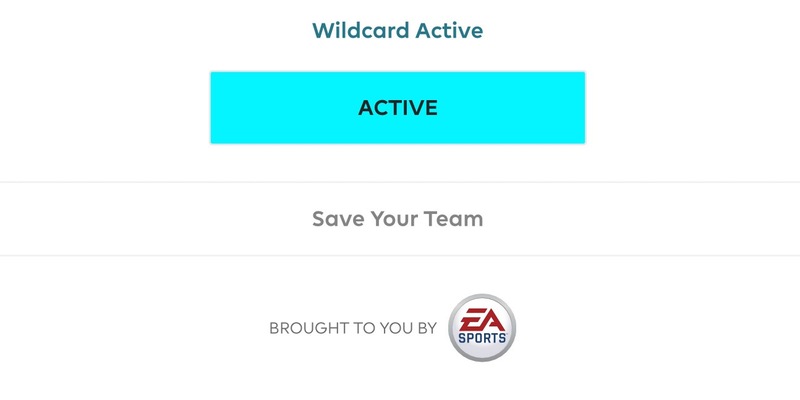 Harry Kane looks like the prime captain for the Gameweek 34 wildcard and Double Gameweek: as he’s chasing the golden boot his inclusion seemed obvious. A double up in attack for the season run in looks incredibly tempting, with Christian Eriksen, Dele Alli and Heung-Min Son all credible option. It’s the Dane who is selected as he seems less prone to rotation. Arsenal have excellent upcoming fixtures, although 4 of the 6 are on the road where they struggle, with no clean sheets all season. Leno doesn’t keep enough clean sheets and Kolasinac is rotation prone. With the midfield constantly interchanging, Mkhitaryan and Ramsey are not considered. Alexandre Lacazette plays more advanced than Aubameyang, plus provides a cost saving. Chelsea aren’t considered due to their unpredictable form and lack of doubles. Liverpool have massive pressure on them to deliver in the season run-in, with a game against Chelsea and then away to Cardiff in the double. Sadio Mane’s hot streak appears to be over and Mo Salah is too expensive given the busier schedule of the other top six sides. Andrew Robertson has outscored many players this season, so is selected for cover purposes. A Liverpool attacker will probably be transferred in after the Gameweek 35 Bench Boost, with great fixtures for their final three games. 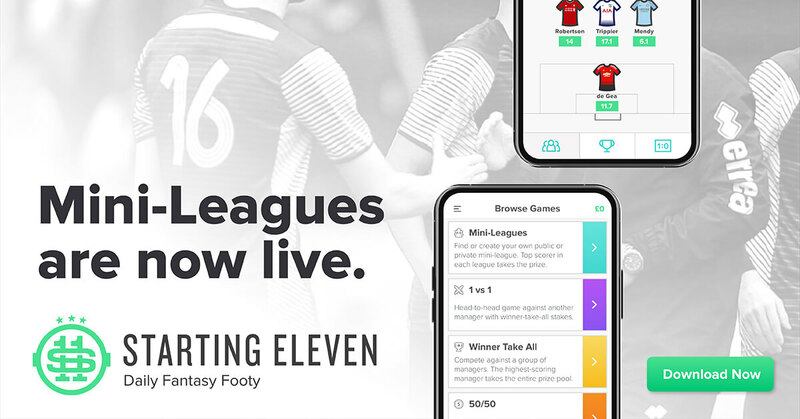 The other sides with a Double Gameweek are Wolves, Watford and Southampton: these teams provide great budget enablers with a reasonable pair of fixtures. Wolves and Watford are chasing 7th place plus FA Cup glory. Southampton are looking to avoid relegation. Wolves have been great all season, with Matt Doherty, Diogo Jota and Raul Jimenez vying for attention. A triple up does seem a little risky, and Doherty has seen some rotation in recent weeks. For Watford, Ben Foster seems far more secure at the back than any of their defenders and can be benched for the Arsenal game for the Gameweek 34 wildcard. Deeney, Deulofeu and Doucoure are all great attacking options. Southampton have plenty of budget defenders to select from, with Gunn, Valery and Bednarek excellent transfer targets. Valery has the edge given his attacking threat. From the attack, midfielders Redmond, Ward-Prowse and Hojbjerg all up for consideration. James Ward-Prowse appeals given his set piece responsibility. 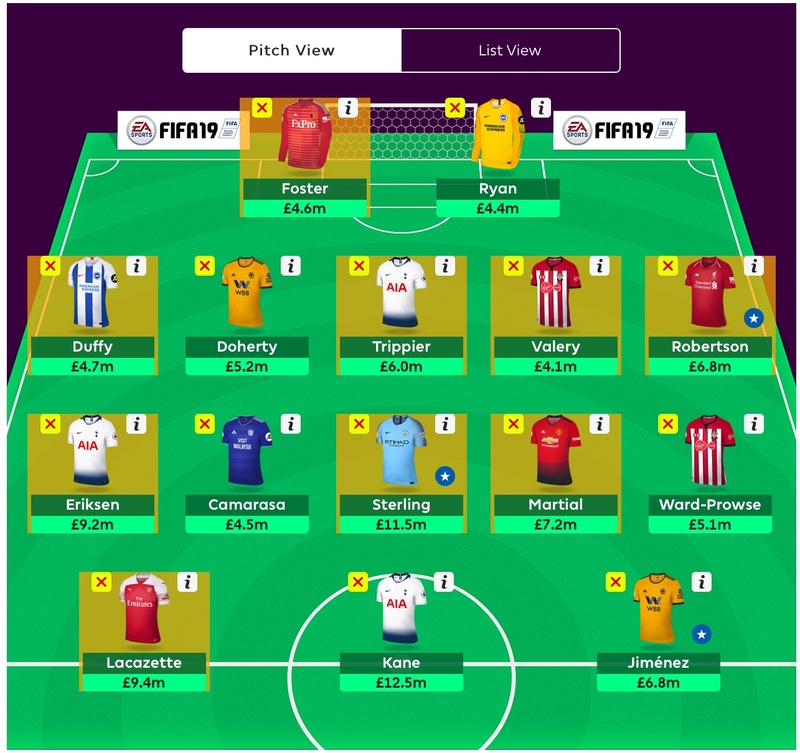 Here’s the initial draft for the Gameweek 34 wildcard, with the bench packed in preparation for using the Bench Boost chip in Double Gameweek 35.